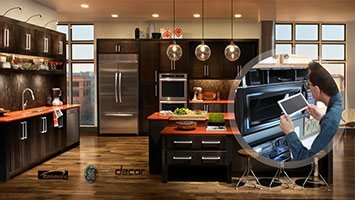 Schedule your service with Appliance Repair Ontario CA. We are experts in home appliances and all services. Every single technician on our team is certified, licensed, insured, and qualified. We are all professionals here and equipped to do our job right the first time. With the help of our experienced appliance service technicians, issues are tackled quickly and efficiently. There are no recurring problems with us. Committed to providing the best customer service, we offer affordable and high quality services to cover all needs. Ontario, California, is home to the multipurpose Citizens Business Bank Arena and hosts the second biggest Quilt Show in the country. Our company is located in this lovely community and gives back by offering reasonably priced, prompt, and quality home appliance service. Whenever faulty appliances make your life hard, depend on us. Our appliance technician will come to diagnose the problem and offer the best solution. When it comes to issues, we do our best to help as soon as possible. Our company offers same day service. Our techs will go the extra mile to deal with faulty gas stoves and ovens, washer leaks, and problematic fridges. Our appliance repair tech arrives to your home fully equipped. We bring the spares needed to replace damaged appliance parts. Our pros utilize the best diagnostic equipment and have the tools not only to check but also repair appliances on the spot. With our help, repairs become easy tasks. If you are tired of dealing with faulty appliances, let us maintain them regularly. We offer great appliances service with the intention of keeping them all in excellent condition and safe. When our pros service appliances, they pay attention to any detail. They do anything required to ensure safe and correct performance. We are equally thorough when we install appliances. No matter which model you get, trust our skills. No matter which appliance you want to replace, give us a call. We do the job expertly respecting the appliance's specs. We are the solution to your concerns. One call to our Appliance Repair Ontario team and we'll be there for you. Contact us today.